This came in the mail today, some for orders, others are new things. I am working on a new pattern, but have not quite perfected it the way I visualize it in my head. I am sure that makes sense right? I have not had the chance to really browse fabric much lately, and I know a ton of new stuff has been rolling out from many designers. Anyone know of any that I need to see?? Oh I need a fabric shopping day bad! You can check out all the other Sunday stashers here. Love the owls, you can always come to my store!! if you need more!! Where did you get the owls and guitars? I must have them! Brice is feeling better today. Want to try for Wednesday? We'll hit up Holly Hills and Pine Needle. 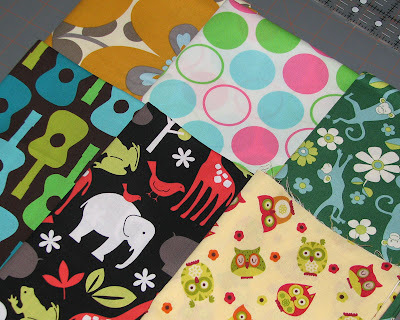 ...and maybe swing by Fabric Depot? I also must know where you got those owls!!! I got it here, no surprise thats where I get most my fabric now.